The Mediterranean climate is characterized by dry and warm/hot summers and cool to mild and wet winters. According to the Köppen climate classification, it is dominant on the Iberian Peninsula, particularly the Csa variety with summer droughts covering all but the far northern part of the country where the Oceanic climate predominates. Local climatic categorizations divide this climate into "Standard Mediterranean" of lowland regions and "Continentalized" mediterranean of the interior, according to altitude and the mildness/harshness of the winter season. The standard mediterranean covers coastal areas (excluding the northern Atlantic coast) the Guadalquivir river basin and the lower reaches of the Tagus and Guadiana basins to the west of the country. The "Continentalized" Mediterranean climate predominates in Spain's vast table lands (Meseta Central) of the interior. The oceanic climate (Cfb) is located in the northern part of the country, especially in the regions of Basque Country, Asturias, Cantabria, Galicia and Navarre. The semiarid climate (Bsh, Bsk) is located in the south eastern part of the country, especially in the region of Murcia and in the Ebro valley. In contrast to the Mediterranean climate, the dry season continues beyond the end of summer. Apart from the three main climate zones, other sub-zones can be found, such as the alpine climate in the Pyrenees and Sierra Nevada, a typical subtropical climate in the Canary Islands and the southern coast and a Hot Arid climate in parts of the South East Coast, notably around Almeria city and the Cabo de Gata region. The Csa hot-summer mediterranean climate is found on most of the coast of Spain starting from the border with Portugal to the border with France, with a few exceptions. The Csb warm-summer mediterranean climate is found in most of north-western coast of Spain, practically all the coast of Galicia and the western coast of Asturias. Coastal Mediterranean region is marked by Leveche winds: hot, dry, easterly or southeasterly air currents that originate over North Africa. Periods of these winds, which sometimes carry fine Saharan dust, are more common in spring and are associated with a sudden, usually short-lived, increase in temperature. A cooler easterly wind, the Levante, funnels between the Sistema Penibetico and the Atlas Mountains of North Africa. These easterly winds are the ones which most influence the Mediterranean climate. The summers are hot, the winters are mild and most of precipitation falls in the autumn. Cities with this climate are: Valencia, Palma de Mallorca, Sevilla, Cádiz and A Coruña. The inland areas of the Iberian Peninsula, on the Central Plateau, have a Csa or Csb mediterranean climates (other areas have BSk semi-arid climates) with bigger differences and seasonalities than the coast. The summers are usually hotter than in the coast and in overall very hot, regularly exceeding 35 °C (95 °F). By contrast, there are low temperatures in winter, from cool to cold winters, being not uncommon the temperatures below 0 °C (32 °F). At cities with altitude above 1,000m like Álava or Segovia, the temperatures under −5 °C (23 °F) are not uncommon, dropping up to −10 °C (14 °F) or more during artic cold waves. The cold increases at higher the altitude is. These are often accompanied by moderate snowfall. Although it rarely rains during summer, there is often heavy rainfall in spring and autumn. Cities with this climate are Madrid, Badajoz, Ciudad Real, Logroño and Ávila. An oceanic climate prevails from the Pyrenees to the Asturias, area which incorporating Galicia is sometimes called "Green Spain", characterised by relatively mild winters and warm summers. The climate and landscape are determined by the Atlantic Ocean winds whose moisture gets trapped by the mountains circumventing the Spanish Atlantic coast. Because of the Foehn effect, the southern slopes fall inside the rain shadow zone and so Green Spain contrasts starkly with the rest of Spain. But the summers remain warmer than many comparable North-west European regions (about 21 °C (69.8 °F) in July in Santander versus 16 °C (60.8 °F) in Brest or Liverpool). The rainfall is generally abundant, exceeding 1,000 mm (39.4 in) and is fairly evenly spread out over the year, with the driest month above 30 mm (1.2 in), which is the minimum criteria for an oceanic climate according to Köppen. Although Köppen officially limits the oceanic domain to the Asturias and the Basque Country region, certain authors such as Trewartha prefer to extend this climatic zone to the north-west part of the peninsula to Galicia, due to the moderate summer temperatures. Temperatures vary only slightly, both on a diurnal and a seasonal basis, and averages range from 9 °C (48.2 °F) in January to 21 °C (69.8 °F) in July. The moderating effects of the sea are less prominent further inland, where temperatures are more extreme than those on the coast. Distance from the Atlantic Ocean also has an effect on precipitation levels, so there is less rainfall in the east than in the west. Autumn (October to December) is the wettest season, while July is the driest month. The high humidity and the prevailing off-shore winds make fog and mist common along the north west coast; this phenomenon is less frequent a short distance inland because the mountains form a barrier to the maritime moisture. The Galician climate (Csb) is similar to that of the coastal areas of Oregon, Washington and Vancouver. It is characterised by year-round mild temperatures with drier summer months, often resulting in moderate drought conditions with at least one month per year usually recording less than 40 mm (1.6 in). This is a characteristic which distinguishes Galicia from a typical Cfb climate. Annual rainfall is higher than in the eastern and southern regions, usually ranging from 800 to 2,000 mm (31.5 to 78.7 in). This climate, which is sometimes classified as "Mediterranean", is classified as "Oceanic" according to other authors such as Trewartha, due to the lower summer temperatures and higher rainfall. Nonetheless, the area displays typical Mediterranean features, including regular forest fires, which are often started deliberately by arsonists. Galicia has high annual sunshine hours, ranging from 1800 hours in the north east to 2200 in the south west. In North-West Castilla, the climate is classified also as Csb because the temperatures of summer are cooler due to the altitude. The semiarid climate (BSk and BSh in the Köppen climate classification) can be found in south-eastern Spain (covering most of Alicante, Murcia and Almería provinces), and in certain parts of the Ebro Valley. It is very hot during the summer (temperatures can exceed 40 °C (104 °F) and the drought usually extends into the autumn (rainfall about 300 m - ). The desertic climate appears in a few zones of the south-eastern coast of Spain. It appears predominantly in Almería, with the city of Almería falling under the hot desert climate categorization (Köppen: BWh) as the average temperature is 19.1 ºC and the average rain amount is of 200mm. Also enters in this categorization the zone of Cabo de Gata, which is known for having also a BWh desertic climate, with rainfall as low as 156 mm (6.1 in) a year which is reportedly the driest place in Europe. The desert climate also appears in other zones, as the Tabernas Desert, which has an annual average of 17.9 ºC placing it just 0.1 ºC below under the categorization of BWh hot desert climate, so it has a cold desert climate (Köppen: BWk). In the southernmost coast of Murcia and the southernmost of the province of Alicante (near Torrevieja) the desertic climate can be also found. The mountainous climate is present in the Picos de Europa, Sistema Central, Sistema Ibérico, Pyrenees and Sierra Nevada, qualified as an Alpine climate. The Canary Islands have a subtropical climate in terms of temperature, this being mild and stable (18 to 26 °C or 64 to 79 °F) throughout the year. Most of the islands have hot desert climates or hot semi-arid climates, and a few zones have tropical semi-arid climates, like the city of Santa Cruz de Tenerife, which surpasses 18 °C or 64 °F in the coldest month, meeting the requeriments for tropical climates under the Köppen climate classification. In terms of precipitation, the eastern islands are semiarid while the westernmost ones receive more rainfall, with some very wet areas in the mountains of La Gomera and La Palma, home to the cloud forest known as laurisilva. The easternmost islands are arid with Saharan climate moderated by the Atlantic Ocean. The southern Mediterranean coast (Malaga and Granada's coastal strip) shares traits with both Mediterranean and Subtropical zones, with total absence of winter frosts allowing for the prolific cultivation of tropical fruits such as Mango. The unusually benign winter, with minimum night temperatures in January rarely falling below 8 °C (46 °F) is due to the microclimate created by the Sierra Nevada mountains to the north of this coastal strip, preventing cooler north winds from reaching the area. Parts of the south East coast also have a Hot Arid climate, with annual average temperatures above 18 °C and annual rainfall below 200mm. Almeria province is the only area in Europe within this climatic zone. The records of temperatures in Spain have been, −32 °C (−26 °F) in Lago Estangento in the Pyrenees (Lleida) for the coldest, for the hottest 47 °C (117 °F) in Seville and Écija. ↑ "World Map of the Köppen-Geiger climate classification updated – (see p.3)" (PDF). Retrieved 2011-04-30. 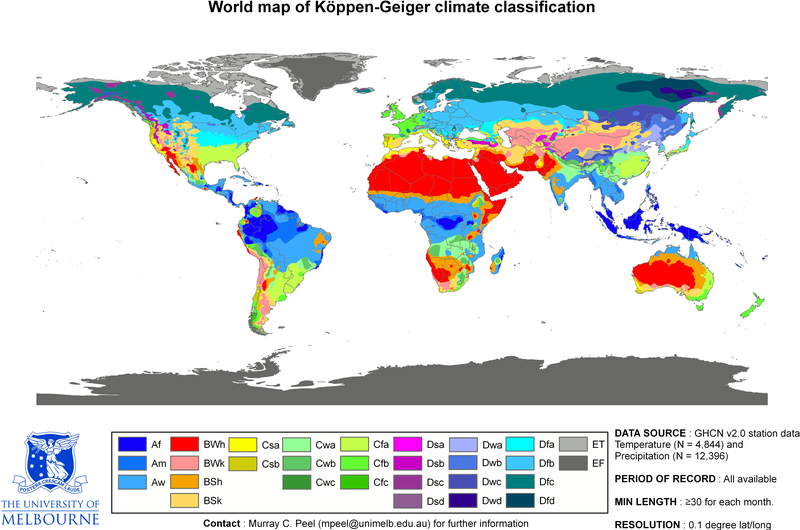 ↑ "World Map of Koppen - Geiger Climate Classification". City-data.com. Retrieved 2013-09-08. ↑ "World map of Köppen-Geiger climate classification". The University of Melbourne. Archived from the original on April 30, 2011. Retrieved August 15, 2011. ↑ "Barcelona Can Bruixa – climate (1987–2010)" (PDF). Retrieved 9 November 2016. ↑ "Valores Climatológicos Normales. Bilbao - Aeropuerto". Aemet.es. Archived from the original on 2009-06-29. Retrieved 2013-09-08. 1 2 "Valores climatológicos normales: Galicia - Agencia Estatal de Meteorología - AEMET. Gobierno de España" (in Spanish). Aemet.es. Retrieved 2013-09-08. ↑ "Valores Climatológicos Normales. Murcia - Alcantarilla". Aemet.es. Archived from the original on 2009-12-14. Retrieved 2013-09-08. ↑ "Valores Climatológicos Normales. Murcia - Alcantarilla / Aeropuerto". Agencia Estatal de Meteorología. Archived from the original on December 14, 2009. Retrieved June 26, 2011. 1 2 3 4 5 "Standard Climate Values, Spain". Aemet.es. Retrieved March 2, 2015. ↑ "Temperatures in Spain". IberiaNature. ↑ "Climate and weather of Murcia". IberiaNature. ↑ "Climate and weather of Sevilla". IberiaNature. ↑ "Climate and weather of Cordoba". IberiaNature. ↑ "Climate and weather of Malaga". IberiaNature. ↑ "Climate and weather of Granada". IberiaNature. ↑ "Climate and weather of Zaragoza". IberiaNature. ↑ "Climate and weather of Valladolid". IberiaNature. ↑ "Climate and weather of Teruel". IberiaNature. 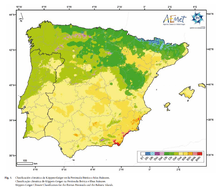 ↑ "Climate and weather of Albacete". IberiaNature. ↑ "Climate and weather of Bilbao". IberiaNature.